High-resolution version of this photo. 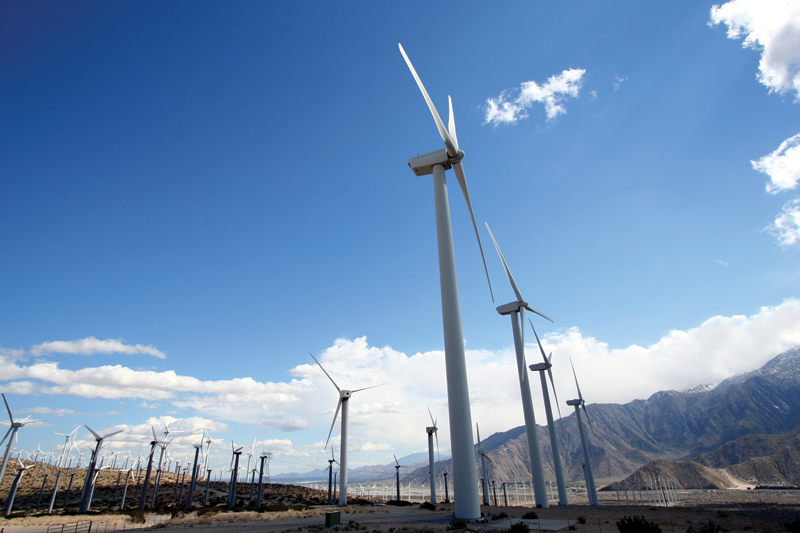 With consumers in "gas pump shock," environmental issues looming and the economy threatened by recent oil price hikes, wind power is increasingly being promoted as a viable source of alternative commercial energy. The advantages of wind energy are numerous. Randall Swisher, executive director, American Wind Energy Association (AWEA), states, "Wind energy is a clean, safe, domestic, abundant and affordable energy source and one of the best options we have for new power generation." According to AWEA, the production of wind-generated power this year will surpass that of 2005, which broke all existing records. Last year, wind turbines capable of producing 2,400 megawatts (MW) of power were installed in 22 states, bringing the total amount wind of wind generated power in the USA to 9,149 MW, enough to serve the equivalent of 2.3 million homes. Mark Haller, president, Haller Wind Consulting, says, "The wind industry is in a very steep growth curve, and prospects for integrating wind power into the normal energy mix in America are very good. We're only seeing the beginning of a long-term growth industry." 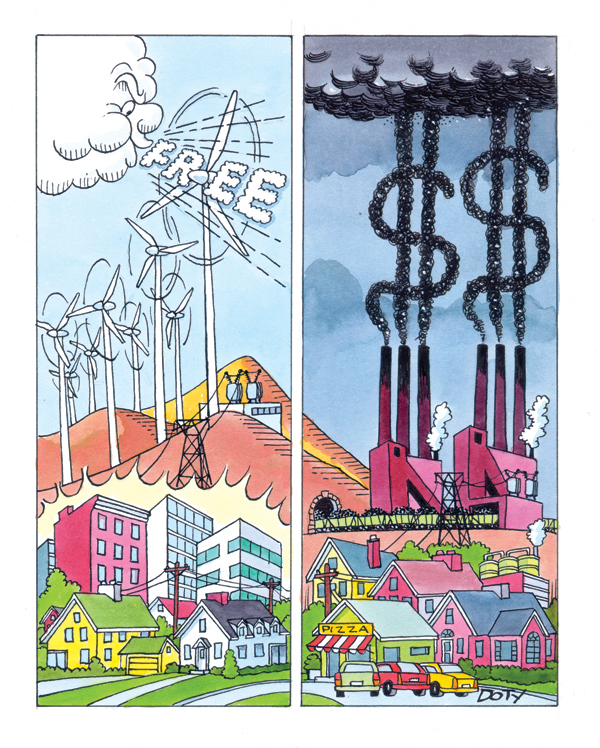 Wind turbines are built by developers who own wind farms and sell power to utilities or who build wind farms for utilities that own them. Although California has the most installed wind energy infrastructure with 2,150 MW of power generation, Texas is about to overtake it. "Land owners love wind farms because of the money they receive from leasing land to developers," says Mark Kapner, senior strategy planner, Austin Energy. The Texas utility is accelerating its use of wind energy and will have almost 200 turbines in place by the end of the year. Kapner expects more than 20 percent of Austin Energy's electricity to come from wind power by 2020. Another benefit of wind energy is the price. According to Kapner, "The cost of our wind power contracts from 2003 to 2006 increased by almost 50 percent, but it's still economical compared to natural gas. So we use less fossil fuels and wind power is more economical." 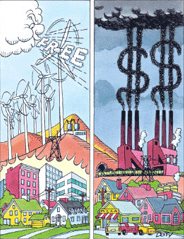 Wind power reduces dependence on finite fossil fuels. Copper plays a crucial role in the delivery of wind energy, based on its high-conductivity, low electrical resistance, and resistance to corrosion. Some wind farms contain more than 300,000 feet of copper wire. Electricity generated through wind power flows through insulated copper cables to a copper-wound transformer. Underground copper cables collect the electricity from the base of each tower and deliver it to a substation that transmits it to the utility grid. Even a modest wind farm uses a great deal of copper wiring. A 36-turbine project in Ainsworth, Nebraska, uses more than 14 miles of bare copper grounding as protection against lightning damage. Another 3 miles of copper wire comprise the ground rings encircling the foundations of each tower, and a similar length conducts electricity to the transformers at the base of each tower. Wind turbine manufacturers are steadily increasing the amount of energy that can be produced by wind towers, from 1.5 MW to 2 MW and beyond. GE currently has a 3.6 MW prototype. One major factor affecting the development of wind power is the extension of federal production tax credits. Since 2000, tax credits that encourage development have periodically expired, only to be extended, creating uncertainty in the market. But in 2005, Congress extended eligibility before it expired, granting credits for production through 2007. New initiatives at the state level also have encouraged investment in wind power. "Many states now require utilities to generate more power through renewable energy," says Kathy Belyeu, AWEA. New York State's goal is to create 25 percent of its power through renewable sources by 2010. Because hydroelectric power already generates 17 percent of New York's energy, only 8 percent needs to be added.